Keywords are the foundation Textiful. You can think of each keyword as a separate lists that your audience will join. Each keyword will allow you to collect email addresses (and other information) from your audience and send outgoing text campaigns. The first step in creating a keyword is determining the best shortcode to use. A shortcode is basically a phone number. Your audience will text your keyword to that number to enroll. The shortcode that you will use is determined by the data you wish to collect from your audience. Textiful provides a quick questionnaire when creating your keyword that will help you to determine the best shortcode for your needs. Textiful has two shortcodes - 345345 and 444999 - and both offer different functionality. 345345 is the recommended shortcode for "text only" keywords and keywords that are going to collect email addresses. This shortcode automatically captures your audiences Cell Phone Number, City, State & Zip code information behind the scenes. It can be set up to collect email addresses and has an age verification feature. 444999 should be used if you need to collect multiple pieces of information like email addresses and first names. In order to collect potentially "common" answers - like first names - users will be assigned a unique number when they first text your keyword. This results in the initial response coming from a different number than 444999, which can confuse some users. For this reason, if you are don't need to collect name information or some other "unique" data, we recommend using the 345345 shortcode. 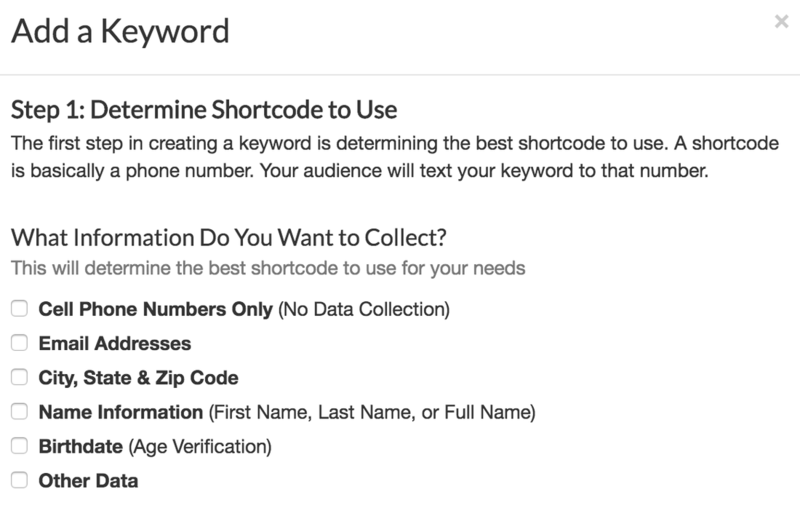 Once you've determined which shortcode works best for the data you're collecting, it's time to see if your desired keyword is available. Just enter it into the text box. If the keyword is available, you'll see an indicator that it's available and you can claim it!